First Glance at Twitter's new Event Targeting advertising: Careful when you dip your Toes into the Deep Waters of Global Events - Harold Tor. Twitter recently introduced a new feature that make marketeers jump up in joy. Called ‘event targeting’, the feature allows you to create a promoted tweet at major global events. As Twitter outlined in its 23rd July blogpost during the very quiet rollout of this feature, event targeting helps you ‘activate around live moments, quickly and easily‘. First, log into your account on ads.twitter.com. Under ‘Tools‘, you will find the first feature of event targeting, the ‘Event Calendar‘. The ‘Jump to date‘ button lets you choose any date in the future. The ‘All event types‘ button lets you sort through ‘Sports’, ‘Entertainment’, ‘Holidays’, ‘Conferences’, and ‘Other’ events. The ‘All locations‘ button lets you sort through ‘All locations’, ‘United States’, ‘United Kingdom’, ‘Ireland’, ‘France’, Japan’, ‘Brazil’ and ‘Global’. Once you’ve identified a global event that you want to target, click on it to access the second feature, the ‘Event Insights‘. As you can tell from the screenshot below, not all events contain data from the previous year. On the right, you get a panel of about 9-10 ‘tweet highlights‘ – presumably tweets with the highest engagement rates. Once you decide to target this event, scroll back up to the top right corner and click ‘Create new campaign‘. What do I think of this new marketing feature? In general, I am really happy with this new feature! 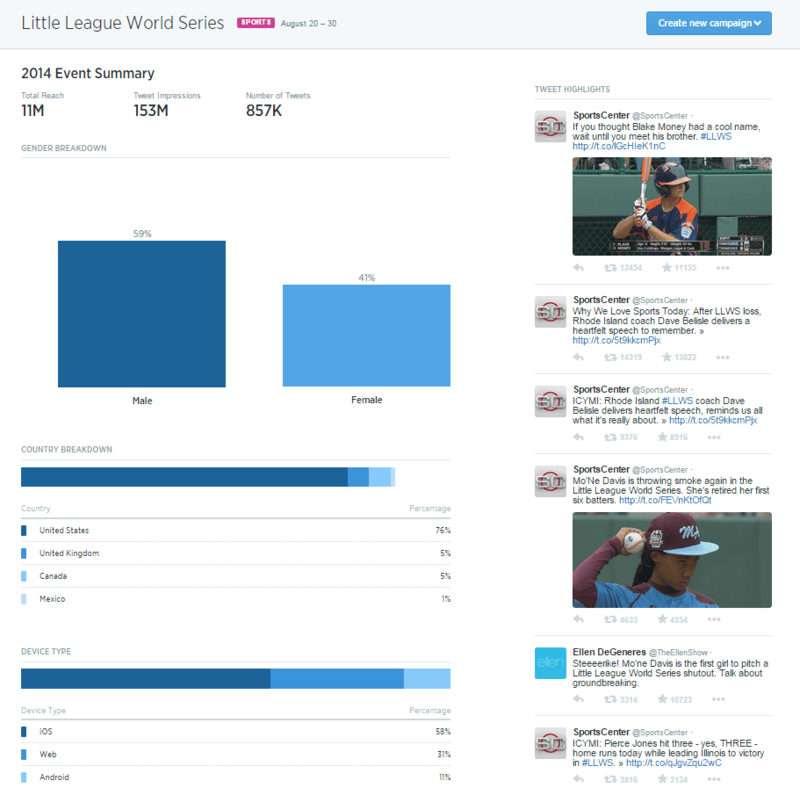 It shows you that Twitter is aware of its usage by digital communicators and marketeers around major events. To come up with this function so that it allows you to easily mould your outreach based on these live events is a very clever win-win feature for us and for Twitter. But the more I explore this feature, the more questions I have regarding its implementation – which I hope Twitter can help me with. There is a set of pre-selected major events right now. Looking at the interface, there should not be more, otherwise it would be terribly congested. Nevertheless, I do not see a clear-cut criteria for these events. Are they strictly based on the event types defined by Twitter? Then where do I find a major event like the European elections? Can we suggest events to Twitter in the future? Do they first feature national events in the countries featured in the list, and the rest are grouped under ‘Global’, because those are the biggest markets for Twitter? If so, I have a problem with this because these may not be the markets I want to target. 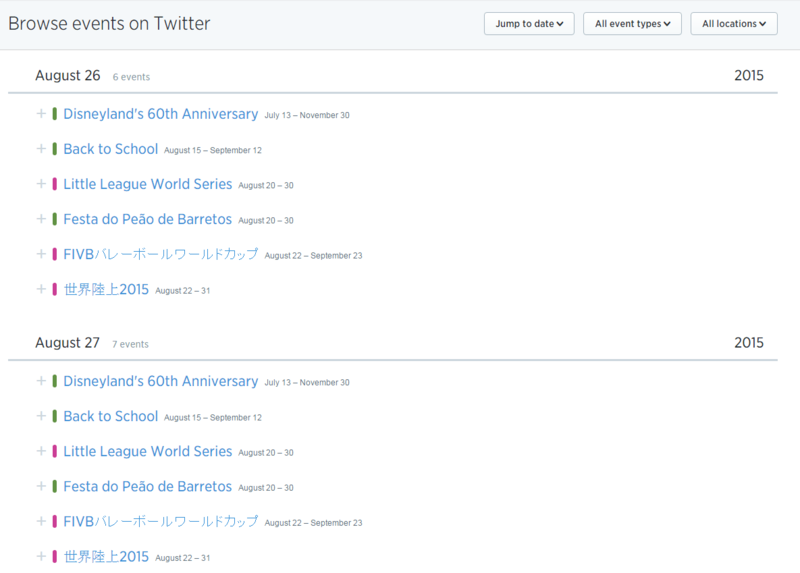 Maybe in the future, Twitter can provide different markets and different lists of events based on your location. Are these the most useful metrics to gauge your outreach? The total reach, number of tweets, and tweet impressions do give you an idea about how big an event was, in terms of discussion on Twitter. Bearing in mind the more tweets there are, the easier it is to get lost among other tweets trying to vie for visibility. Gender Balance and Country Breakdown are useful, because they help you shape your content so that they can be aimed at either men or women, and it can be in a certain language and made appealing to the local culture. Device usage is useful because it tells you what kinds of tweets you should produce. Mobile users are less likely to click on a link – if they do, the site you send them to had better be responsive in mobile with a simple action button. Otherwise, all your content needs to be INSIDE the tweet, supplemented by image, moving gif or video. That is simply not enough to help me craft targeted tweets. I need to know the content scope of last year’s event tweets, the hashtags used, the emotions expressed, the links shared, the images used, the tweet rate throughout the event, who the influencers were etc. The list of ‘tweet highlights‘ on the right simply does not tell me all that. The other question I had was about the further definition of criteria. Once an event is selected, you click on the button to create a promoted tweet, it is basically the same interface as per normal. But, if for example I want to create a tweet that targets only women, I can still define that in my promoted tweet. But how would that conflict with the ‘right audience’ that Twitter has supposedly pre-defined? I still think this is a great feature, despite a few much-needed fine-tuning plus some explanation from Twitter. But I won’t jump into it without doing the necessary research to come up with targeted, engaging tweets that everyone at the event will like. This takes me to this first tool that Twitter came up with for its UK and Ireland market called #OwnTheMoment Planner . 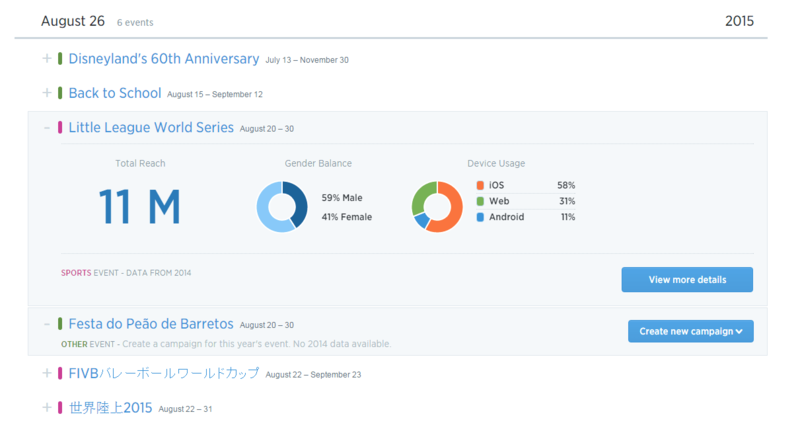 This gives you a 3-month calendar of upcoming events that you can tweet on. A nice little tool that looks like much of what the event targeting grew out of. For those who haven’t played with this simple tool: it simply alerts you to new major events. Once you’ve spotted something, you first go do your research before you launch yourself into producing promoted tweets around that event. I think the same should still be done here. Hold your reins until you’re clear who you want to target and with what messages. Come up with the content and the criteria before you create your campaign. Questions or comments about this new feature? Let’s chat about it on Twitter @HaroldTor.